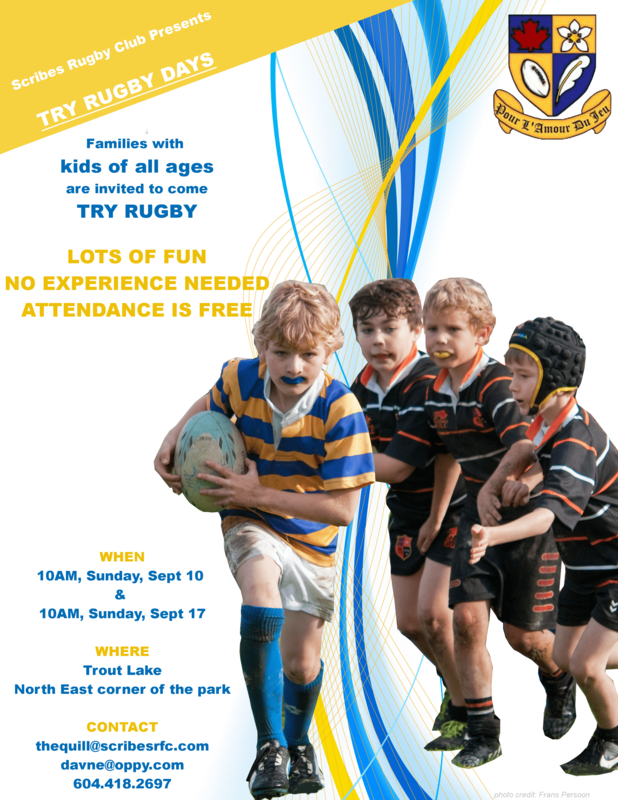 The Scribes Rugby Club and the Scribes Mini Rugby Program are pleased to host a pair of upcoming Try Rugby Days open to families with kids of all ages. The events, which will allow children and teens to learn the basics of rugby, practice passing and kicking the rugby ball, and get some quality exercise, will take place in the North East corner of Vancouver’s John Hendry Park / Trout Lake on both September 10th and 17th. Each session begins at 10am. For more information, contact Scribes Mini Rugby coordinator Dave Nelly at davne@oppy.com, 418-2697 or the Scribes general inbox at thequill@scribesrfc.com.